The One Year Premium Slimline Large Print Bible features an easy-to-read 11.1 point font and deluxe binding that is perfect for the growing large-print market. 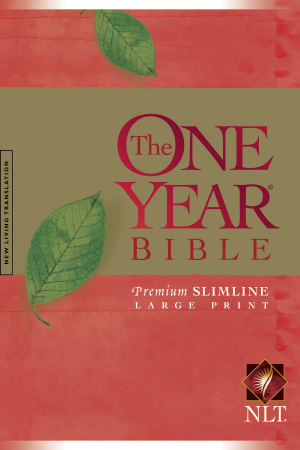 The One Year Bible helps people read the entire Bible in as little as 15 minutes a day. It divides God's Word into daily readings from the Old Testament, New Testament, Psalms, and Proverbs, creating an achievable, unforgettable devotional experience. NLT One Year Large Print Bible: Paperback by New Living Trans 2 was published by Tyndale House Publishers in February 2007 and is our 10450th best seller. The ISBN for NLT One Year Large Print Bible: Paperback is 9781414312446. Be the first to review NLT One Year Large Print Bible: Paperback! Got a question? No problem! Just click here to ask us about NLT One Year Large Print Bible: Paperback. Please can you tell me which of your large print bibles has the largest size print. I'm sorry I don't understand the font point sizes is 11 point bigger print than 9. Thank you. A:The smaller the number of the point size, the smaller the text. Most Bibles are about 8-Point sized and most large print Bibles are about 11 or 12. There are some Giant print Bibles which are in 13 and above, such as this one: (https://www.eden.co.uk/shop/budget_holy_bible__new_king_james_version_giant_print__burgundy__1844.html). Thank you for using the Q&A Forum. Is this a proper full Bible, or is it just daily readings? A:The NLT One Year Bible does feature the full Bible text, though not in strict content order; it arranges the text into the form of 'Daily Readings' from the Old and New Testaments, Psalms and Proverbs.